We learned a lot about growing cacao during our visit to the Belcolade cocoa plantation in Tikul, Mexico. I’ve had the pleasure of visiting small cacao farms and larger cacao plantations and cooperatives in eight countries (to date!) during my chocolate travels. And without hesitation, I tip my hat to the Belcolade cocoa plantation near Xlapak Labná (meaning “old houses” in the Mayan language) Tikul region of the Yucatan state of Mexico for being the cleanest and best managed operation I have ever seen. Mario “Concho” is the very knowledgeable manager of the Belcolade cocoa plantation in Tikul, Mexico. 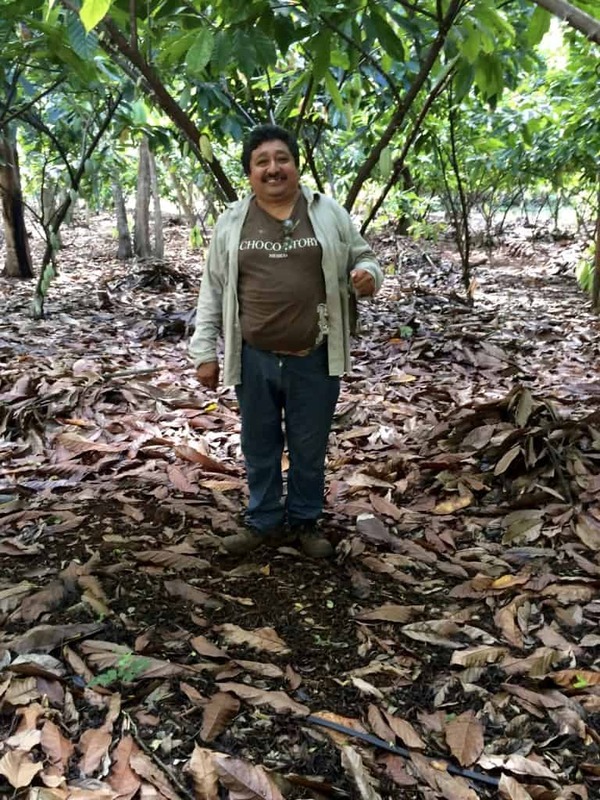 He is standing among the fallen cacao leaves, which turn into mulch to naturally fertilize the growing cacao trees. The lower leaves of the trees are pruned to increase ventilation around the trees and prevent disease. I’m sure this level of excellence and efficiency is partly due to Mario “Concho,” the very friendly and capable manager of the operation, who was kind enough to not only take me for a guided tour of the 30-hectare (74-acre) farm, but also made me an authentic Mexican lunch afterwards. The Belcolade cacao plantation has 50,000 trees and is located just 40 kilometres from the UNESCO Heritage site at Uxmal. In 2018, the Belcolade plantation expanded to 330 hectares of land with the purchase of 300 new hectares to plant and develop. Most of the original cacao trees on the Belcolade plantation are of the Trinitario Uranga varietal, although there are 10 different varietals of Trinitario grown here. Tests are being done to try and increase the amount of Criollo being grown at Belcolade, and help return Mexican chocolate to its authentic form–the finest grade of Criollo. 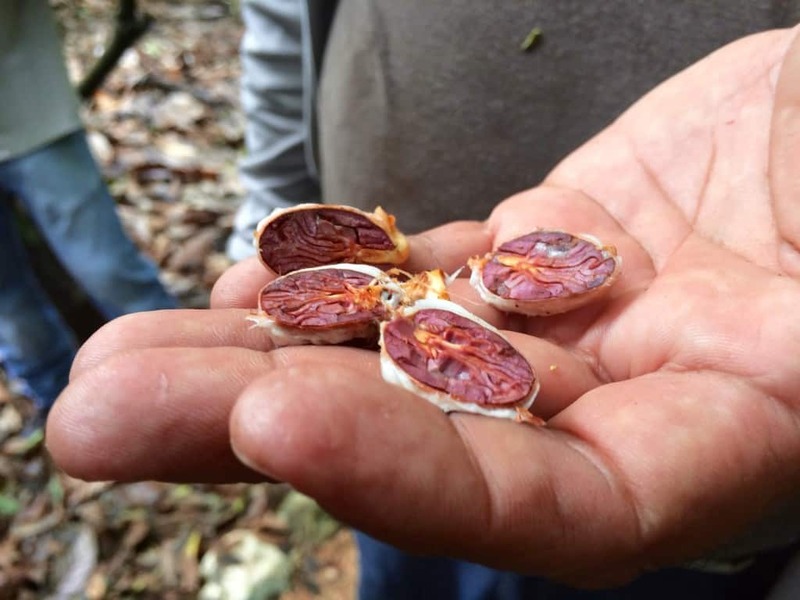 But Criollo is prone to disease, and so the battle continues with test varieties to up the quality and keep the Belcolade plantation disease free. 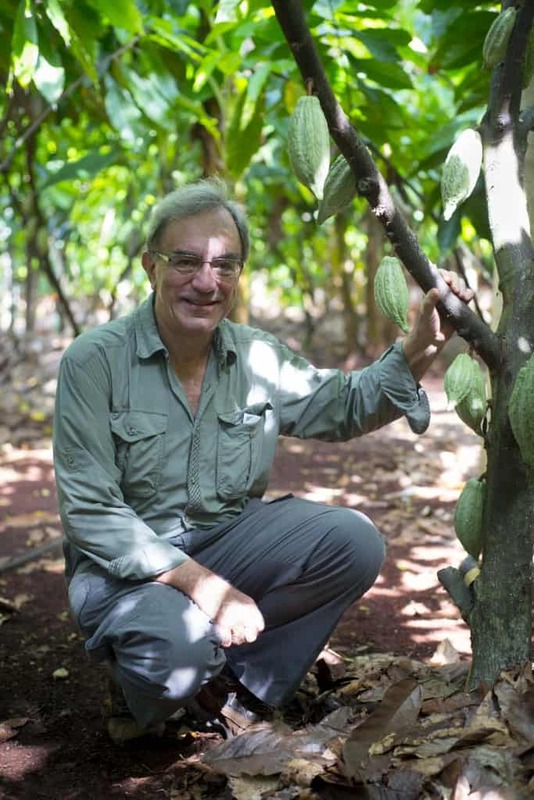 Eddy Van Belle is the founder of the Cocoa Development Foundation and the Choco-Story Chocolate Museums. He is a chocolatier and Chairman of the Board of the Puratos Group, a company that provides product and services to professionals in the chocolate industry. 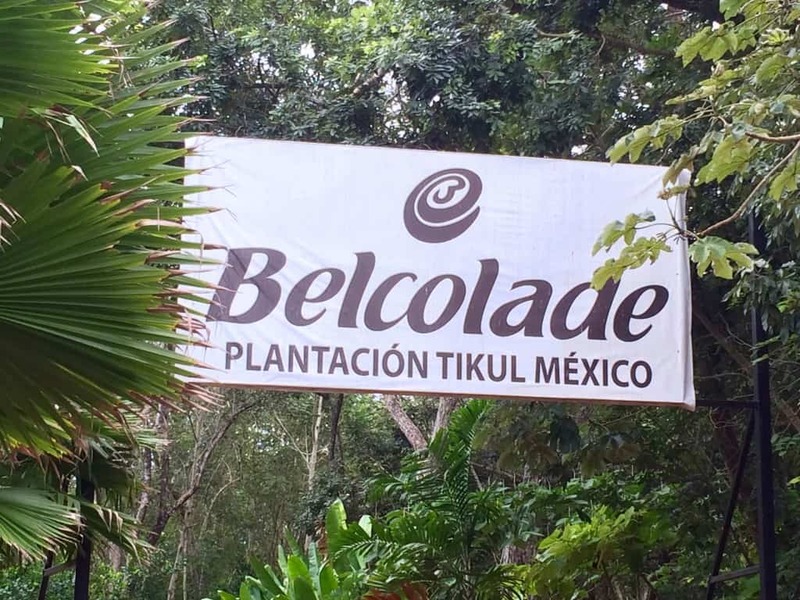 The Belcolade cocoa plantation in Mexico is owned by renowned Belgian chocolatier Eddy Van Belle of Begium, who also owns the Choco Story chocolate museum in Uxmal, Mexico, and several other Choco Story locations in Europe. Proceeds from the museums go to funding the Cocoa Development Foundation that Van Belle uses to help small farmers improve their practices and help advance other worthy initiatives in the world of chocolate. This is the cacao nursery at Tikul. 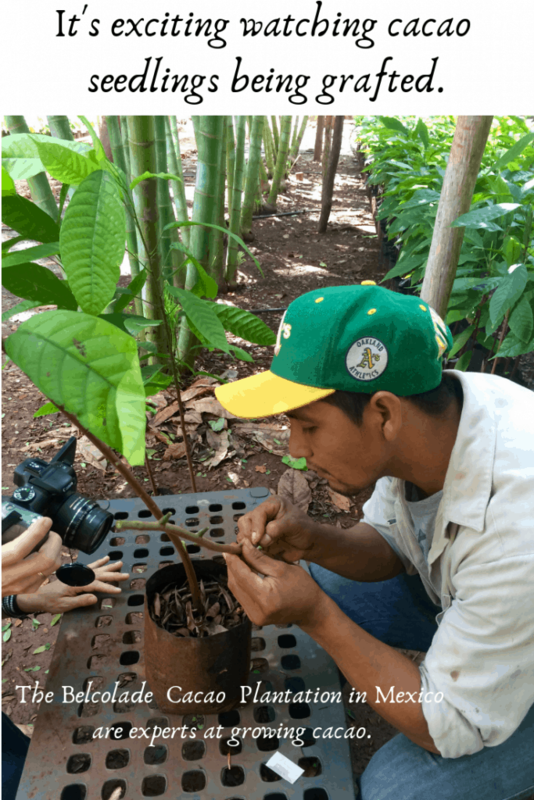 There are 250 cacao seedlings grafted everyday at the Belcolade coco plantation in Tikul, Mexico. The Belcolade plantation has achieved good results through its very precise grafting program, shown below. Van Belle also makes chocolate in Belgium under the name of Belcolade The Real Belgian Chocolate. 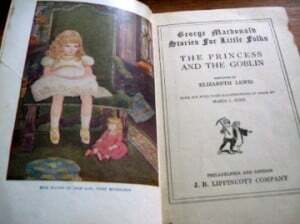 It’s amazing how this story is interwoven in so many aspects of the world of chocolate! Belcolade is owned by Puratos, a company that does research and development in the world of chocolate, and oversees the Belcolade operation as part of its service to the chocolate industry by providing quality couverture made in the Belgian tradition. The Belcolade cocoa plantation also supplies cocoa beans to ki’XOCOLATL, the terrific Mexican chocolate maker I visited in Merida. There are other chocolate makers who have hectares of cocoa grown on this land and managed for them by the staff at Belcolade. 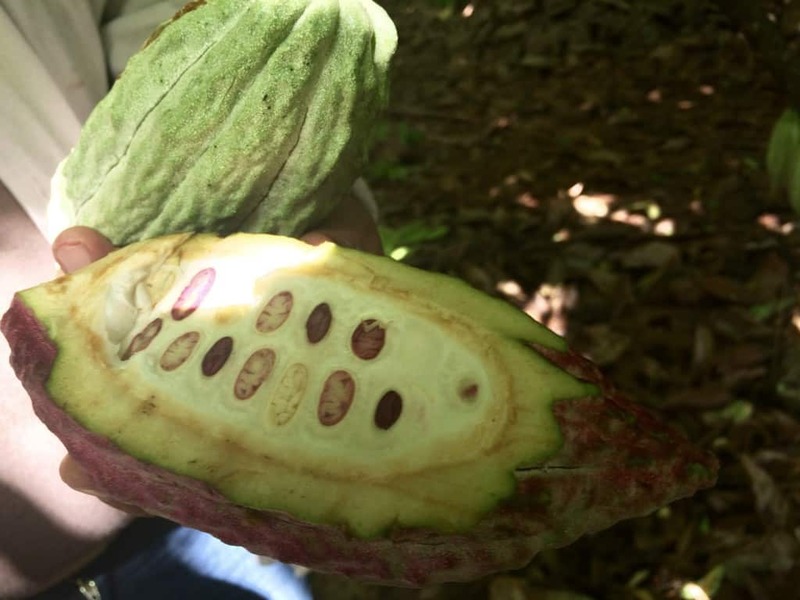 I was fascinated to learn that some Trinitario pods have 60% white cocoa beans and 40% beans of the traditional reddish brown colour. That doesn’t mean that the white beans produce a white chocolate. But it does mean that the flavour profile of the chocolate made exclusively from white beans (also known as albino cacao or Jaguar beans) is different, rare, and highly coveted. Raw cocoa beans at the Belcolade plantation in Tikul, Mexico. I was amazed at the amount of science that is involved in growing cacao. There is cacao grown in the Chiapas region of Mexico, but conditions are not nearly as favourable as they are in Tikul, so the amount of disease is considerable, and the yield much lower. Chiapas has roughly 4,000 millimetres of rain annually. Tikul has only 1,250, making it easier to aerate the crop and keep the trees and pods healthier. As cacao grows best in temperatures ranging from 15-26 degrees Celsius, the climate of the Yucatan is very suitable in nourishing the trees and preventing the monilia disease from spreading. The Tikul area is also blessed with a peat-moss type soil that is ideal for growing cacao. Woodpeckers and squirrels are a constant challenge to the cacao crop. And this is where it all begins. The cacao trees can have as many as 8,000 tiny blossoms on them, but may only produce 80 pods per tree from those blossoms! Survival of the fittest. As always, an interesting description of chocolate, this time in Mexico. Which reminds me that I had a wonderful cup of Mexican hot chocolate a few days ago in Oakland, California. Viva Mexican chocolate! Right on, Carole! Mexican chocolate is getting better and better, and we have companies like Belcolade to thank (in part) for that. So much goes into making chocolate and we just take it for granted. Thank you for opening my eyes up to the “behind the scenes” account of How chocolate is made. How considerate of the team to provide you with lunch after rhe tour- hospitality goes a long way. Hi Phoenicia. Yes, I was pretty amazed at how knowledgable Concho was in all the detail he was sharing with us about growing cocoa. And then to get into the kitchen at the dining hall and whip us up a terrific lunch of beef, fresh avocados grown on-site, Mexican-style beans and tortillas, was quite a bonus to our visit! I really appreciated the educational value of your article. 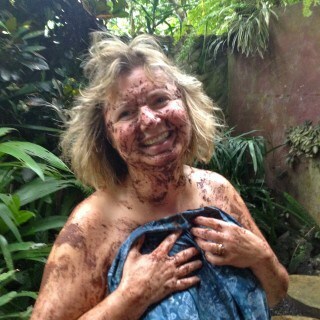 I learned a lot about cacao trees. The Cocoa Development Foundation was of interest to me as they are getting to the grassroots to ensure the preservation of these valuable plants. I had just read a story yesterday where there is only about 1000 wild triangle palms left in Madagascar. There used to be a huge jungle of them very sad really. Keep up the exploring! Much appreciated. Thanks so much, Janet. I always enjoy your comments and encouragement. Yes, it’s amazing how many animal and plant species are in jeopardy or already instinct. I’m sure you’ve heard about the last male white rhino dying last week. So sad. I like learning that in the majority of your chocolate travels, you have come across cooperative farming and a holistic approach to growing cacao. It makes me even more fond of indulging in the occasional bite of delicious, rich chocolate! Hi, Rose, and thx for your comment. Yes, there are so many noteworthy aspects to chocolate and cacao. I’m really excited to be participating in the ceremonial cacao event at the International Chocolate Fest in CA later this month. How interesting to learn about Mexican chocolate. I really like the flavors of Mexican chocolate. It makes great hot cocoa. I would love to taste some of this chocolate. The chocolate made from the white cocoa beans would be interesting to sample since you mention it is highly coveted. It was also unexpected to find the connection between the Mexican and Belgian chocolate. Hi Debbie. I did taste the ChocoStory bars at the gift shop at the Choco Story chocolate museum and Eco-park at Uxmal. It was good, and made from the cocoa beans of the Belcolade plantation. I love chocolate, and have always been fascinated by the process of its making. Visiting a cocoa plantation and understanding how chocolate is really made is a dream of mine. A trip to this place would be a dream come true! 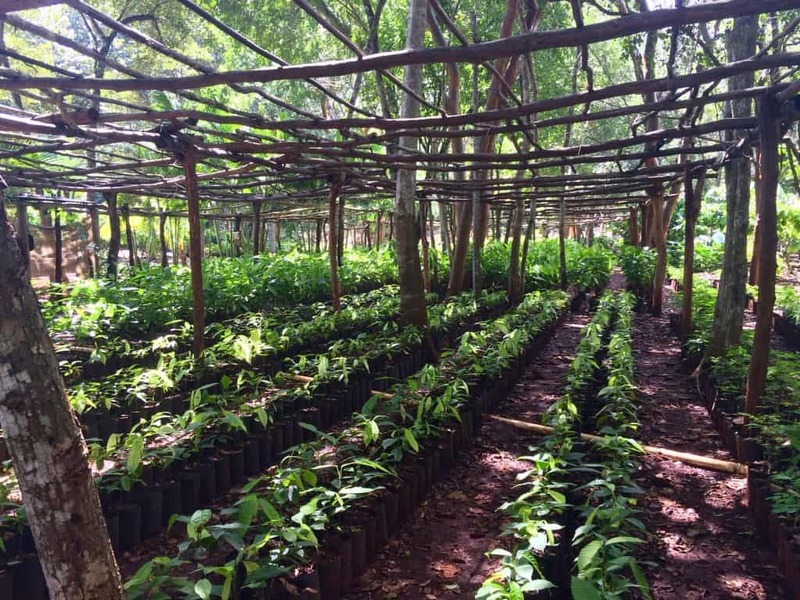 🙂 Thank you for this virtual tour, a glimpse of this beautiful cocoa plantation through your eyes! What an interesting tour round the plantation! I never knew that plants could be affected by albinism as well as animals. Hi Kemkem. Visiting a cacao plantation the DR in Jan/09 is where the initial seed for Chocolatour was planted! Interesting that you have memories of cocoa growing in Nigeria. A fabulous chocolate maker that I know has a project going with Nigerian cocoa growers and is helping them learn how to process the cocoa and make handcrafted artisan chocolate right there in Nigeria. You did it again. 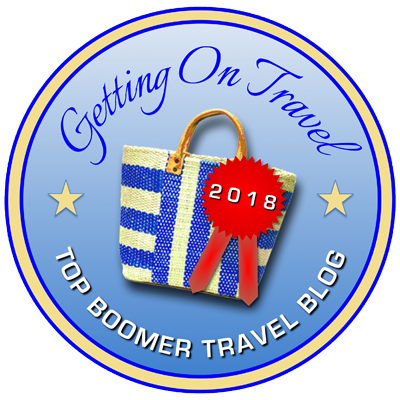 Chocolatourism is certainly a great niche. Interesting for all chocolate lovers like me! 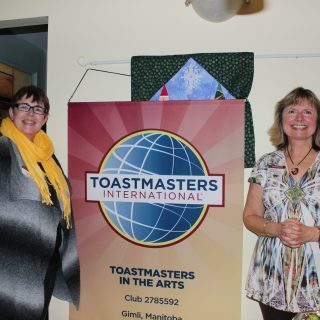 I was just in the Yucatan in January. 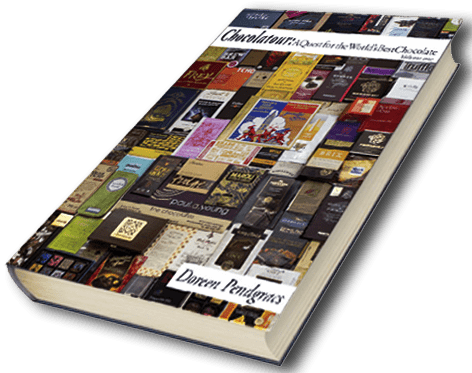 Given the number of manufacturing sites, you have visited while researching your two “Chocolatour” books they must run a pretty amazing operation for you to give them such high praise. I’ve enjoyed some pretty amazing spiced Mexican hot chocolate, so can only imagine what theirs has to offer. Hi Debra and thx for your comment. Keep in mind that I am giving Belcolade a very big thumbs-up for the way they grow and process cacao and run their cocoa plantation. I shall have to ask for some samples of the Belcolade Belgium-made chocolate and see how it compares to the Choco Story Mexican-made chocolate, both made from the same beans. Should be an interesting taste test, as they are processed very differently. It is interesting to learn about all the science involved in growing cacao. And it is nice to hear about places like Belcolade cocoa plantation. I hope they do manage to successfully grow more Criollo. It is interesting to learn about all the science of cacao. I loved reading the science behind growing cacao. 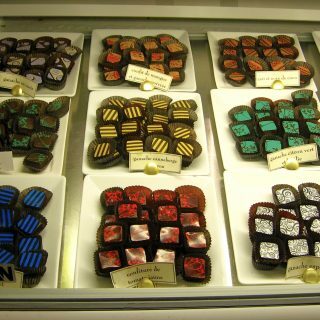 It was an eye-opener as to how much effort goes into making chocolate. 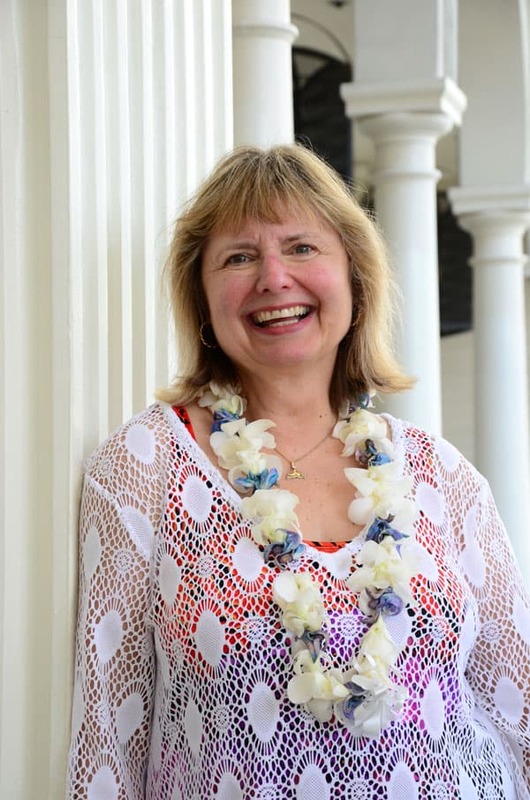 Thanks for such a wonderful post about chocolate Doreen! I simply loved it. Thanks, Kalyani. It truly is my mission to help chocolate lovers understand the magnificent world of chocolate and cacao through every step of the growing, production, and creation process. Great info about the Belcolade cocoa plantation in Mexico being owned by renowned Belgian chocolatier Eddy Van Belle of Begium. That’s surely a guarantee of top quality. Looking forward to sampling some on my next visit. Hi Michele and thanks for your comment. Eddy Van Belle seems to be involved in so many aspects of the world of chocolate. I’m so grateful to have his support of my work. I absolutely love everything about the Yucatan. I’ve been many times but have not been to the Belcolade cacao plantation. I’ll return to that part of Mexico for sure, and now that I have such a glowing recommendation, I’ll have to check it out. You find the best places! It was interesting to learn that this is the source of some yummy Belgian chocolate. Hi Irene. Yes, the world of chocolate is no inter-connected, and now quite complicated. For example, a friend of mine recently brought me some chocolate from Portland, Oregon. It was made there, but with beans from several cocoa producing countries like Peru and Madagascar. So when we say Belgian chocolate, we know there has to be another country involved that actually grew the cacao and processed the cocoa beans. I hope you had the chance to also sample some chocolate. Growing up in tropical Kerala, my grand parents’ house had a couple of cacao trees. It was not grown commercially, but was more of an experiment for my grandpa. We children used to pluck the ripe pods and eat the sweet pulpy fruit. If you haven’t had the chance to taste the fruit yet, do try it whenever you visit another plantation. They taste quite amazing. Hi Denny and thx for your comment. Yes, I’ve eaten the cacao pulp several times in different countries. It is quite sweet has you say. India is now producing some amazing cocoa and I’ve got it on my list as a chocolate destination I will cover in the volume III of Chocolatour. After all you have seen and done in the world of chocolate, your high praise of Belcolade Cacao Plantation in Mexico is enough for anyone to make sure and visit if they are visiting the area. I know I would! Excellent article! Thx so much for your words of kindness, Marilyn. I always love reading your posts because I can just taste the chocolate-y deliciousness. 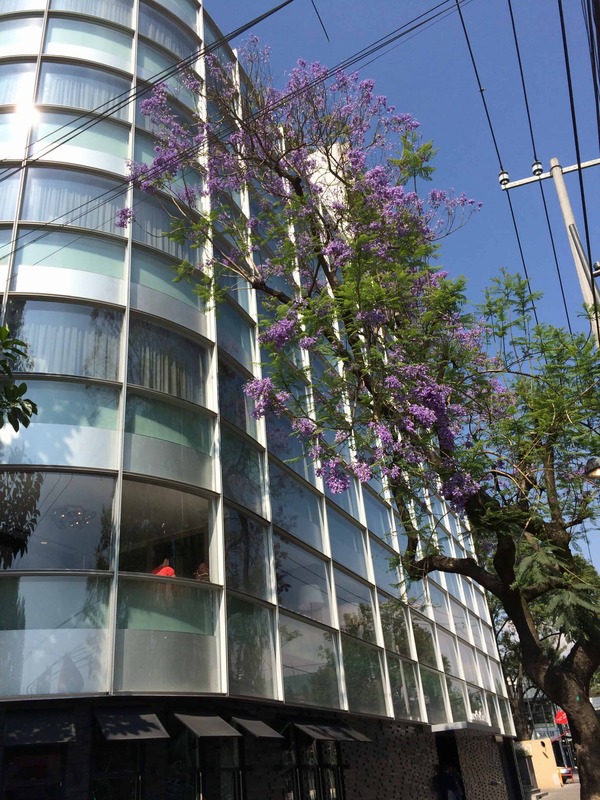 But with post, I learned about a place I didn’t even know existed in Mexico. And now I want to visit! Thanks for keeping our chocolate meters full! When you say it’s the cleanest best managed chocolate operation you’ve seen, that’s really saying something. I would love to hear more about the lunch he served you. I bet it was delicious. Thx for your comment, Sue. The lunch Concho served me was a very traditional Mexican meal of beef and avocados, salad, beans and tortillas. All ingredients local and fresh. It was delish! I love the stories you tell of the sources of one of my favorite foods. . .keep them coming! Pardon me for sounding so naive, but I was really not aware of the term “cacao”. When I started reading your article, I thought you had mistaken “cocoa” for “cacao”. But then as I read on, I did a quick search on net and got introduced to cacao. So, your writeup really added to my knowledge base today! And every time I read about such a farm on your blog as this one, it only increases my respect for the workers who put in so much of effort to grow the plants in the right conditions. After all ,that is where the root of our chocolates lies, isn’t it? Thanks for your comment, Neha. 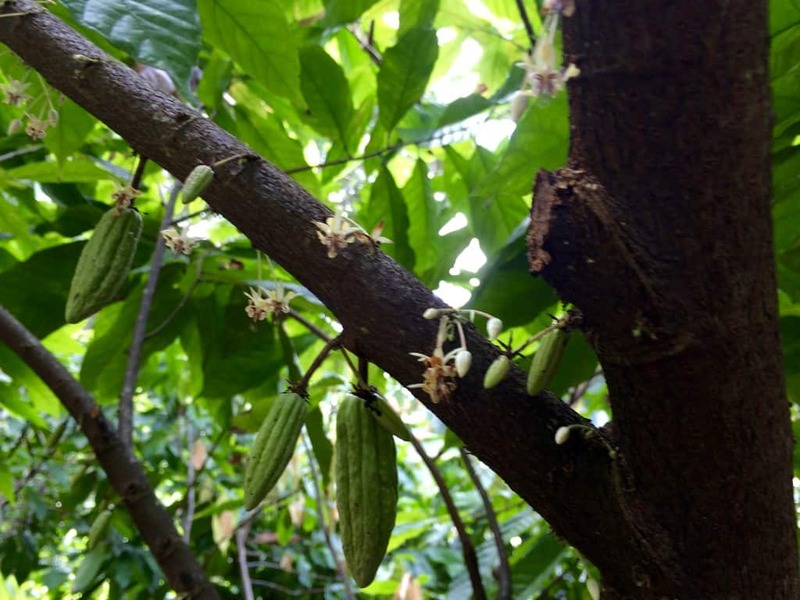 Yes, Theobroma Cacao is the scientific name for the tree that grows cocoa pods that are used to make chocolate. So they are cacao farms or plantations, and they produce a product called cocoa that is used to make chocolate. I’m glad that my posts are helping chocolate lovers around the world learn more about chocolate and where art comes from. Never knew so much goes in making of Mexican chocolate. I just love Mexican chocolates 🙂 Thank you so much for an educational post! The growing of cacao is difficult in any country it is grown. But the end result can be exquisite tasting chocolate that we all love. Thx for your comment. You are the Chocolate expert and if you tip your hat at Belcolade cocoa plantation, then it surely means something. I was fascinated reading the tremendous amount of scientific thought and management that goes into Cacao plantation. 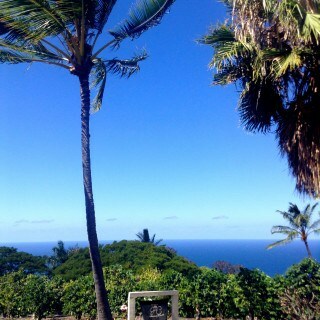 I can easily see why this plantation is held in so much regard. The passion of the people behind it comes through in the post. Guided tours to such plantations seem so interesting. 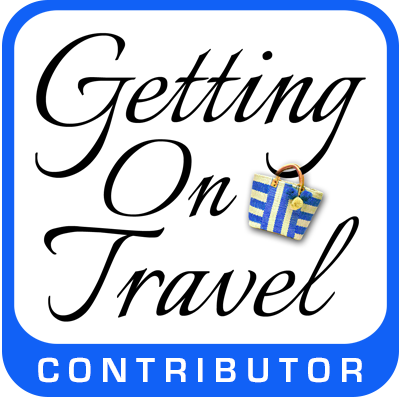 I have never been on cocoa plantation tour and would love to be a part of one. It’s intriguing to know what all goes behind a simple cup of coffee or a bar of chocolate. There is so much of hard work involved in plantation and processing. Great information and amazing photographs. Thanks so much for your thoughtful comment. Yes, the cocoa plantation is a long way off from the final chocolate product, but it is all so integrated. It is fascinating learning about each of the steps involved in the growing and processing of cacao. Great post. I enjoyed learning about Belcodade cocoa. Thank you for sharing, Great info about the Belcolade cocoa plantation in Mexico. I always love reading your posts. I love chocolate and I’m interested to learn about all the science involved in growing cacao. 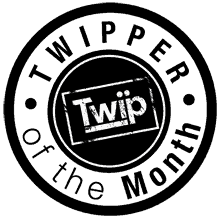 Thank for your writing this post. I’m the one who likes chocolates and often eat them. But I do not know anything about them. Because of your post I know more about chocolate and cocoa. I hope you have more sharing so people can gain more knowledge.